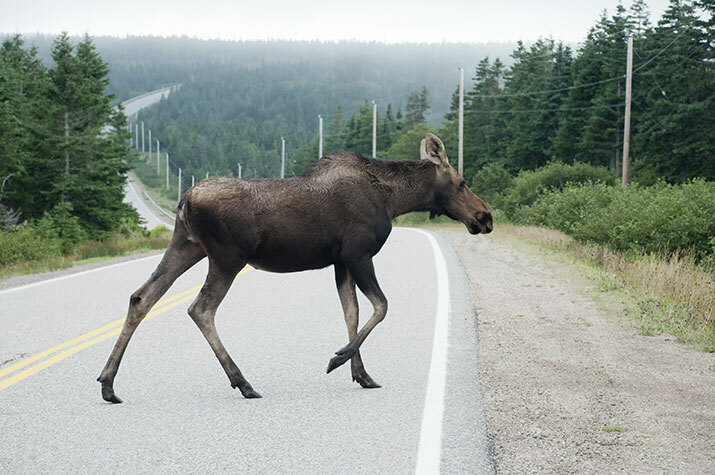 Canadian Wildlife Federation: What should I do if I see a moose while I’m on the road? Q: I keep hearing horror stories of moose colliding with vehicles. What should I do if I see a moose while I’m on the road? A. That would be a nerve-wracking moment, for sure. There’s a variety of reasons why moose are attracted to roads. In the spring and summer months, moose will frequent the roadside to get some relief from insects and also to feed on plants. When the winter comes, they’ll eat road salt by the roadside, and will also use roads as an alternative to walking through deep snow. That said, weighing up to 1200 pounds and standing up to 1.8 metres, moose can definitely damage vehicles and cause serious injury should they be involved in a vehicle collision. They are simply unpredictable. Just because you see a moose standing at the edge of a road, don’t assume the moose will stay there - it could jump in front of your vehicle. To reduce your chances of having a collision with a moose, the best defence is staying alert. Watch the road, both sides, especially in areas that are marked with warning signs, and slow down. More accidents occur during dusk and dawn so be sure to drive with your high beams on when able to do so. What happens if you do see a moose? For this one I had to consult with the Wildlife Collision Prevention Program. If you are in a situation where you have to make a decision between swerving or hitting a moose, they say to consider swerving. If there is no time to swerve, or it isn’t safe to do so, and a collision is unavoidable, get as low in your seat as possible, even under the dash if you can. It’s not uncommon for moose to completely crush a vehicle’s roof. And don’t depend on whistles or reflectors to ward off wildlife. I’ve read that through various testing none have been proven to work.